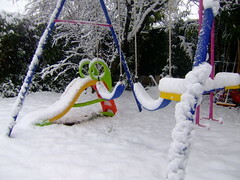 Frozen Snowy Swing and Slide -- Let's have it ! There’s been a lot of cold weather and frost so far this December, and a fair bit of snow. I’ve never seen quite so much fall in one morning as I did today though. I reckon we’ve had 10-15cm (4-6″) of snow in a few hours. Last night there was already a bit. It took us 3/4 of an hour to get back home from the town centre, usually a five minute drive. Some steep roads were impossible to get up at all, and every start from stationary was with wheel slip. Horrible driving conditions. Friday night was awful too. Friends coming to visit us before leaving for Morocco took over six hours to get from Calais to Argenteuil – usually a 2 and a half hour trip. They just made a window of mostly rainy / sleet weather to take off from Orly mid Saturday and are now basking in 28°C in Marrakech. Snow makes the garden look beautiful, and I love the eerie light of late evening where street lamps and moonlight combine with the reflectiveness of fresh snow. It is totally impractical for getting about though, Monday morning could be a real challenge. I hope local authorities and the government now start preparing for earlier wintry weather, rather than once again blaming “unseasonable” conditions for not having stocks of salt, grit and vehicles enough to keep infrastructures moving. This entry was posted on Sunday, December 19th, 2010 at 5:36 pm and is filed under France, general, photography. You can follow any responses to this entry through the RSS 2.0 feed. You can leave a response, or trackback from your own site.